Drywall lift that reaches 11' 4" (accepts 8' or 16' sheet) and holds it tight while it is screwed into place. An 18" extension is available for higher lifting. Will also tilt to hold drywall against a wall. Breaks down neatly to fit into a trunk. 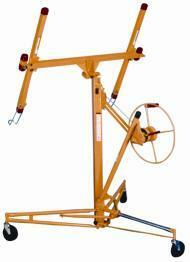 * Please call us for any questions on our 11 foot drywall lift standard rentals in Calgary, Alberta.